The Hummingbirds in Glacier National Park that come visit our feeder provide great entertainment for the guests staying at Smoky Bear Ranch. With our hummingbird feeder located just outside the Bed & Breakfast window, our guests thoroughly enjoy watching the Glacier Park Hummingbirds each morning. Our cabin guests will make special trips to Smoky Bear Lodge just to photograph or video these Glacier National Park Hummingbirds. Click here to see a video our feeder. Three species of Hummingbirds In Glacier National Park come visit our feeder at Smoky Bear Ranch. The species which arrives first each May is the Rufous. 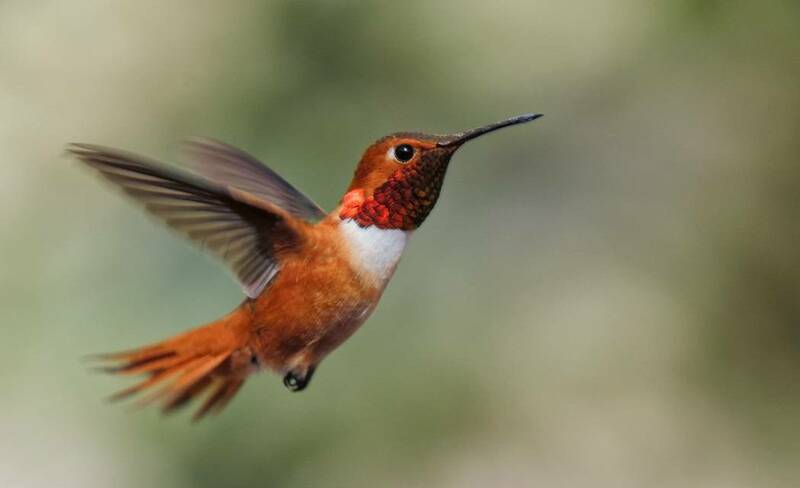 The rufous (rusty) colored crown, back, tail, and sides, the flaming red-orange gorget (throat), and white breast sets these Glacier National Park Hummingbirds apart from all other male hummingbirds. The females are more subdued with a green back and crown, white breast, streaked throat, and rufous sides and base of tail feathers with white tips on the outer tail feathers. 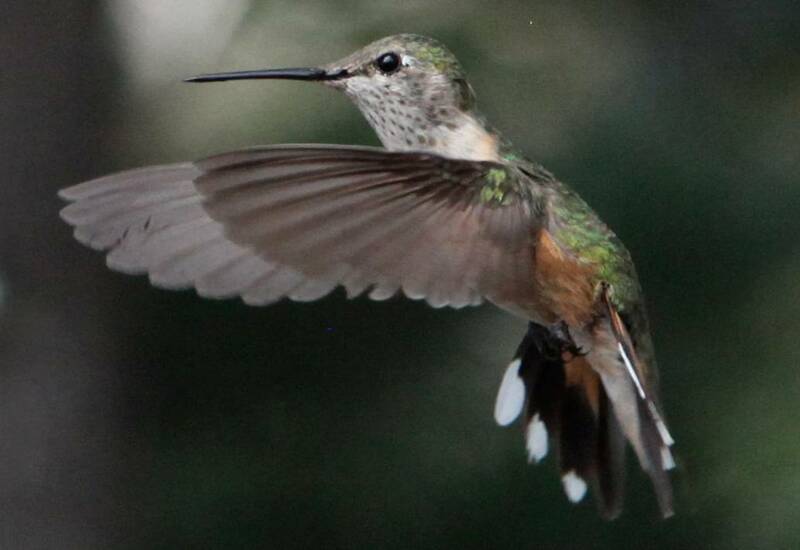 They are one of the smaller Glacier Park Hummingbirds with the males measuring 3¾ inches from tip of beak to tail. They have the longest migration route of all the Glacier National Park Hummingbirds with most of them wintering in mountainous regions of southern Mexico. Some will stay in southern California or Arizona and some will even winter in southeastern United States. Their summer or breeding area are the most northerly of all the Glacier Park Hummingbirds ranging from Northwestern United States to western Canada to southern Alaska. The Rufous nest further north than any other hummingbird and can tolerate temperatures down to -4°F (-20°C). They prefer deciduous or mixed coniferous forests so mature forests or backyards with lots of flowers or flowering meadows nearby will attract the Rufous. Their diet consists of nectar from red or brightly colored tubular flowers and tiny insects – or a well monitored hummingbird feed with sugar nectar. Many of the tubular flowers rely on these Glacier Park Hummingbirds for pollination. The Rufous usually hovers when feeding. They have an excellent memory returning to their favorite feeding areas each year as they migrate between their breeding and wintering territories. They always let us know when its time to put our feeder up as they arrive at the breakfast window each May looking for it. When breeding, the Rufous male courtship display flight traces a steep U or vertical oval, climbing high and then diving steeply, with whining of the wings as they dive and climb and chirping sounds at the top and bottom of the display. Of course this courtship display is to attract the females. But it’s fun to watch them as being the most aggressive of the Glacier National Park Hummingbirds, they will dive at many things i.e. the dog, the cat, a person, etc. The male will mate with several females. The female Rufous is responsible for building the cup shaped nest – usually built 2-10 feet above the ground in a coniferous tree. She will build the nest out of plant fibers and soft moss then line it with soft plant fibers, animal fur, and feather down. Lastly, she strengthens the nest with spider webbing and other sticky fiber which gives the nest an elastic quality so it can double in size as the chicks grow. She will lay 1-3 plain white eggs – usually 2. She incubates the eggs for 12-14 days. She is responsible to protect and feed the chicks while the male is only interested in protecting his favorite feeding areas. The female will care for the chick for 19-21 days until they are ready to leave the nest. Despite what all the bird books and experts say, the Broad-tailed is one of the Hummingbirds in Glacier National Park. They are long bodied Glacier Park Hummingbirds, about 4” long, with the female being larger than the male. The Broad-tailed male and female have an iridescent green back and crown with a white breast. The male has a rose-red iridescent gorget (throat) and a broad tail which is mostly black and accented with green, rufous, and sometimes white. The female is much duller with pale rufous sides, a whitish throat with variable lines of bronzy-green flecks, and outer tail feathers banded in rufous, green, black, and white. Their long broad tail is also conspicuously larger than that of the Rufous hummingbird. Most of these Glacier National Park Hummingbirds will breed in the mountains of northwestern United States at elevations up to 10,000 feet. During the winter, they will migrate to the highlands of Mexico or even as far south as Guatemala. Some of these Glacier Park Hummingbirds with stay year around in the tropical areas of Mexico. When the ambient temperatures fall below 44°F (10°C), the Broad-tailed Hummingbird enters torpor, a slowed metabolic state. It maintains a body temperature of about 54°F (12.2°C) when it enters torpor. These Glacier Park Hummingbirds like to reside in rugged mountain terrain with cliffs, canyons, and rushing streams. They also like open woodland, especially brushy slopes, and riparian and montane scrub and thickets. 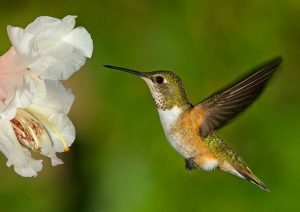 Like the Rufous Hummingbirds, their diet consists of nectar from red or brightly colored tubular flowers and tiny insects – or a well monitored hummingbird feed with sugar nectar. They also may pluck insects from spider webs and occasionally get tree sap from a sapsucker’s drilling. Many of the tubular flowers also rely on these Glacier Park Hummingbirds for pollination. 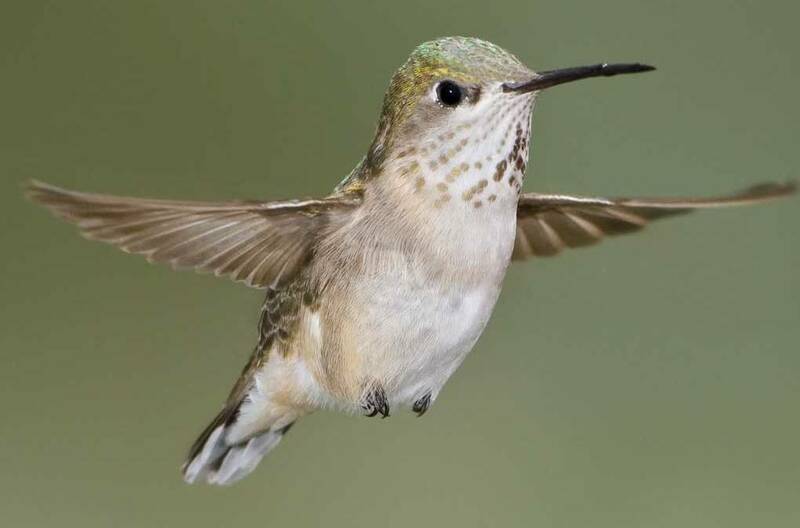 The Broad-tailed hummingbird usually hovers when feeding but will perch when at a hummingbird feeder or even sometimes hang onto the edge of a flower. The older male Broad-tailed hummingbirds witllarrive first to stake their favorite feeding area. They will aggressive defend this area, perching on a high branch or hovering high over the feeding area so they have an excellent vantage point. These male Glacier National Park Hummingbirds will not hesitate to descend aggressively upon almost any intruder in their territory including larger birds, cats, squirrels, human beings, butterflies, moths, bees, wasps, and/or yellow jackets. When an intruder is spotted, they will fly directly at them, chasing the trespasser out of its territory. They will allow a female into this feeding area so they can court them. When courting, the Broad-tailed male will fly before the female in a U-shaped pattern, diving which produces a loud wing trill. Both birds may ascend together, one 4′-5′ below the other, before descending together. He will court a female for only a short time, mate, and then search our other females. The female may also mate with several males. These Glacier Park Hummingbirds nest at some of the highest elevations. The female is solely responsible for building the nest, incubating, and brooding. The female shows strong nesting fidelity, nesting in the same tree each year. They may even build their new nest on top of last years nest. They build their nest on a horizontal limb often near a stream and sheltered from above. The nests are usually 3′ to 30′ off the ground. The Broad-tailed female will build the nest by weaving plant fibers together then camouflaging it with moss. She lines the nest with soft plant fibers, animal hair and feather down, and strengthens the structure with spider webbing and other sticky material which gives it an elastic quality to allow it to stretch to double its size as the chicks grow. There are usually 2 white eggs which she’ll incubate for 14-17 days. The chicks will leave the nest in 21-26 days. The Calliope hummingbird is the smallest breeding bird in North America with the males measuring just 3¼ inches long. These male Glacier National Park Hummingbirds have a glossy green back and crown, a creamy white breast, dark tail, green flanks, and a white throat with wine-red or purple streaks which erect and give a whiskery effect. Despite their small size, they will aggressively defend a feeding area chasing off much larger birds like a red-tailed hawk. 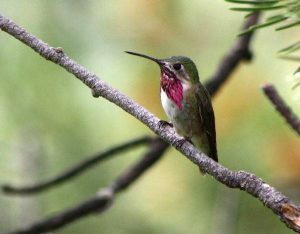 The female, slightly larger than the male at 3½ inches, has a green crown and back, dark tail with white tips, pinkish flanks, and a white throat with dark streaks. These Hummingbirds in Glacier National Park also have a long migration route summering in the mountains of northwestern United States or southwestern Canada and wintering in southwestern Mexico. They are the smallest migrating bird in the world. For their breeding/summer area, the Calliope prefers meadows, canyons and streams in high elevation open montane forests. In winter and during migration, they prefer chaparral, low and brushy areas, and deserts. These Glacier National Park Hummingbirds feed on nectar from a variety of brightly colored flowers close to the ground or scented small flowers of trees, herbs, shrubs. They stick their beaks deeps into the flower and use their long, extendible, straw-like tongues to retrieve the nectar while hovering and licking at the nectar up to 13 times per second. They will catches tiny insects in flight and use sapsucker holes to feed on sap and insects attracted to the sap. The Calliope also favor a well maintained hummingbird feeder. They sometimes will perch while feeding at a feeder and even on the edge of a flower. Males court females by flying in a u-shaped pattern in front of them accompanied by a metallic tzing, then hovering at an accelerated wing-beat frequency of up to 95 flaps per second before the female with it’s wine-red throat feathers flared out. 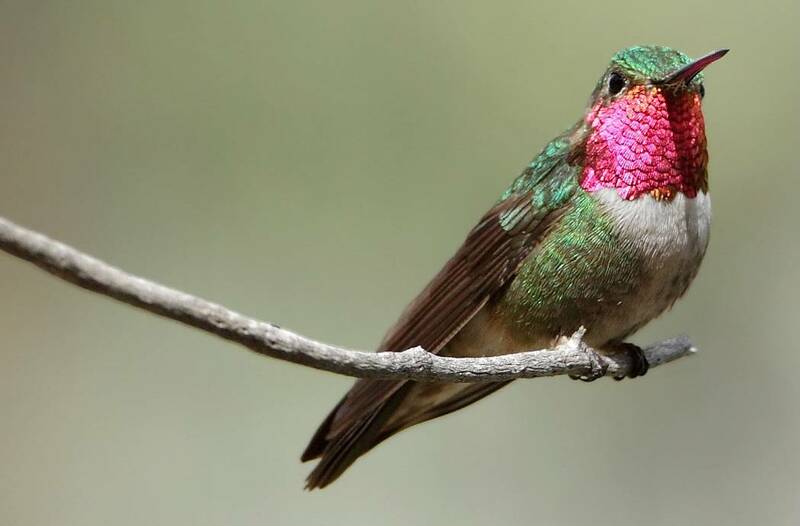 Like our other Glacier Park Hummingbirds, the Calliope male provides no parental care, will mate with several females, and they do not for extended bonds. The female is responsible for building the open cup-shaped nest out of plant fibers woven together with green moss on the outside for camouflage. She lines the nest with soft plant fibers, animal hair, and feather down. The structure of the nest is strengthened with spider webbing and other sticky material giving it an elastic quality to allow it to stretch to double its size as the chicks grow and need more room. These Glacier National Park Hummingbirds will build the nest in a protected location in a shrub, bush or tree, typically underneath an overhanging branch of a conifer tree 4′-40′ off the ground. The nest is often situated over creeks or over roads next to streams or lakes. Many times they will repair the previous year’s nest or construct a new one atop the old nest. The Calliope female will lay 1-3 white eggs, usually 2 and will incubated them for 15-16 days. She feeds the chicks by regurgitating food (mostly partially-digested insects since nectar is an insufficient source of protein for the growing chicks). The female pushes the food down the chicks’ throats with her long bill directly into their stomachs. The chicks will become independent and leave the nest in 18-21 days. The guests at Smoky Bear Ranch thoroughly enjoy the show these Glacier National Park Hummingbirds put on. Our feeder is most active in late June and early July but some of the Hummingbirds in Glacier National Park will stay until mid August. We take our hummingbird feeder down in mid August to encourage the straggling Glacier Park Hummingbirds to start their migration. We hope you’ve enjoyed learning a little about the hummingbirds that visit our feeder. Another video of the activity at our hummingbird feeder.